It’s 15 years since I first filmed a poignant video of salmon trying to negotiate a weir on the lower reaches of the River Bollin, in Cheshire, during the breeding season. 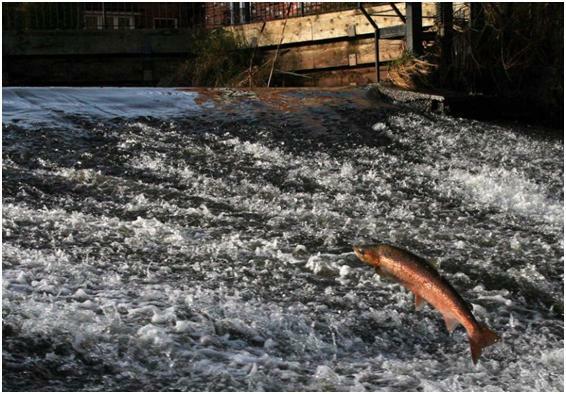 Salmon disappeared from the Bollin nearly two centuries ago due to water pollution and the construction of physical barriers to fish migration – mainly weirs. So we were all excited by what their presence in the river meant. During the latter half of the twentieth century, the Environment Agency and its predecessors were instrumental in working with partners to bring about considerable improvements to water quality. This removed the chemical barrier to salmon migration, however the physical barriers still remained. In 2003 I was part of the team that identified 12 significant barriers to fish migration. We knew that it was going to be a mammoth task, but one which would open up more than 30km of the River Bollin and River Dean connecting these rivers to the migration route the salmon take from the sea to their spawning ground. After collecting and analysing information on the numbers of salmon returning we decided the best option was to build a series of fish passes along the river. 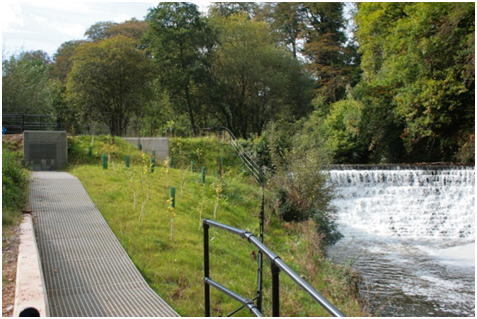 In 2009 the first 2 fish passes were built at the downstream section of the river and it wasn’t long before we were celebrating their success. In 2010 juvenile salmon were captured on a fisheries survey - the first in living memory to be found in the River Bollin! We were all thrilled by this news – this was the proof that all our hard work had been worth it. The juvenile salmon were caught just downstream from the third and, without doubt, largest barrier on the river (at nearly 5m high) - the weir at Quarry Bank Mill. So this was our next challenge. Quarry Bank Mill , owned by the National Trust , is a Grade II listed building of national historical significance as it’s one of the most intact functioning cotton mills in Britain. The weir is integral to the history and running of the mill so its removal was simply not an option. We began discussions with the National Trust about the possibility of a fish pass and it became apparent that they had exciting aspirations of their own. The National Trust expressed their desire to install 21st century hydropower at the mill and so we developed a partnership to take a joint scheme forward. It was a real challenge to ensure we got all aspects of the project right. So, in April this year we were all absolutely delighted to officially open the fish pass and hydropower scheme at Quarry Bank Mill. It’s a site of major significance, so we had to convince people the investment in the river was worth it and work closely with the planning authority, archaeologists and public to ensure minimum impact to the site. But in the end it was absolutely worth it because it has already generated a lot of interest with visitors to the mill. So now we await the arrival of this year’s salmon and hope to capture their migration on camera….watch this space! Did the enthusiasm for salmon in the Thames die away. Have not heard of any work on this recently. The hydropower and fish pass at Quarry Bank Mill Styal was much heralded and lauded leading up to up to and upon opening, quite rightly. However its now 18 month since its completion,and I hear its successfully generating power, but cant find any news at all on the Salmon related part of the project. I sincerely hope this is because it has not been successful in this respect. I for one am still watching this space.... have any Salmon been passing the cameras?